Peel and core the apples, cut them in half. 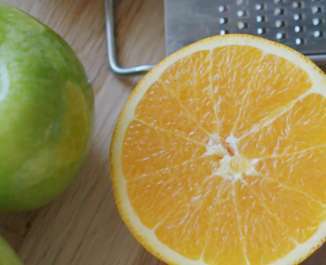 Toss them lightly in lemon juice (to prevent them discolouring). Add the sugar to the pan and over a medium heat let it slowly caramelize, moving the pan from time to time to stop the sugar from burning (which can happen very quickly, so exercise caution when working with hot sugar). Once the sugar goes a golden brown colour, remove it from the heat and add butter in small dice. Carefully place the halved apples around in a circle until compact to the centre, then place the puff pastry over the top neatly tucking it in around the edges. Put the tart in the oven immediately for 25 mins at 190°C. Take out and leave to rest for 5 mins, then place a large plate over the top of the pan and being careful that no hot liquid spills onto your hands, invert the pan, turning the pan upside down so that the pastry is now the base of the tart sitting on the plate. Slowly lift the pan away from the plate. Preheat oven to 180°C/350°F/ Gas 4. Grease and base line a 22cms/9” round cake tin. Put the flour, sugar, butter, eggs and vanilla essence into a bowl and beat until light in colour and well mixed. Stir in 4 tablespoons of the soured cream, finally, stir in half the blueberries with a large spoon. Transfer to prepared tin and bake in central position of oven for about 50 minutes until risen, feels firm to the touch and springs back when lightly pressed. Cool in tin for 10 minutes before transferring to a wire tray, remove the base paper and allow to cool. Meanwhile, make the icing; beat the cheese, remaining soured cream and icing sugar in a bowl until smooth and creamy. 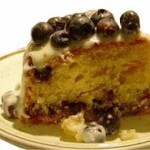 When cake is cold, spread icing on top and scatter on the remaining blueberries. Note: Cake will keep in fridge for a few days but bring back to room temperature for about an hour before serving. Cake can also be frozen un-iced! 4 servings, 1 skewer per serving. As if melted Kerrygold Pure Irish Butter wasn’t enough to make the perfect shrimp, our Garlic & Herb Butter adds aromatic flavor that truly brings this dish to life. Coupled with the zing of citrus and fresh ginger, this light seafood skewer really sizzles. Cut the bottom 1/3 off each lemongrass stalk, then cut in half horizontally (reserve tops to use as skewers). Pull out tender centers and finely chop enough to make 2 tablespoons. 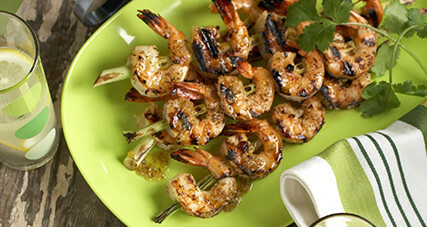 Make a small slit in each shrimp and thread equal amounts onto lemongrass skewers; set aside. In a small saucepan, melt Kerrygold Garlic & Herb Butter. Add lemongrass and ginger and cook for 1 minute. Add sherry, lemon juice and honey and simmer over low heat for 5 minutes; stir in salt. Pour about 1/3 of the mixture over the shrimp; cover and refrigerate for 30 minutes. Grill shrimp over medium coals for 3 to 5 minutes. Turn and cook until shrimp is lightly charred and is completely pink and cooked through. Place skewers over noodles or rice and vegetables, if you like, and drizzle with remaining butter mixture. Garnish with cilantro leaves. Sweet potatoes are the perfect accompaniment to a smokey BBQ flavour and this chicken recipe is a real winner. Optional: Cheese, chopped parsley or sliced green onions. Wash and cut sweet potatoes in half. 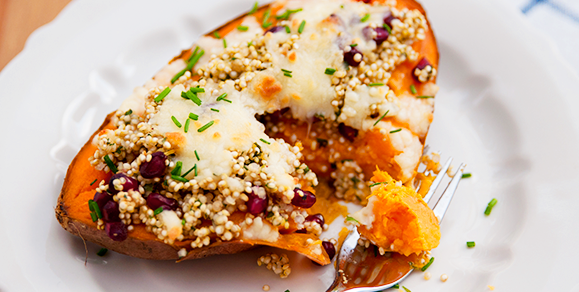 Lay sweet potatoes cut side up on a large baking sheet. Prepare the chicken by pounding the fillets with a meat mallet, so they’re the same thickness and texture. Place the chicken into an oven dish and cover with tin foil. Bake the covered chicken and the sweet potatoes for 40-45 minutes. (After 20 minutes remove the tin foil from the chicken). Remove the chicken and sweet potatoes from the oven making sure that both are cooked. Place the chicken into a bowl and pull it apart into small strips using a knife and fork. In a saucepan stir the chicken and BBQ sauce together on a medium-low heat for 5-10 minutes. Top each potato with a scoop of chicken, spooning over additional BBQ sauce. Sprinkle with some cheese, chopped parsley or sliced green onions, if desired. Who said muffins have to be sweet? 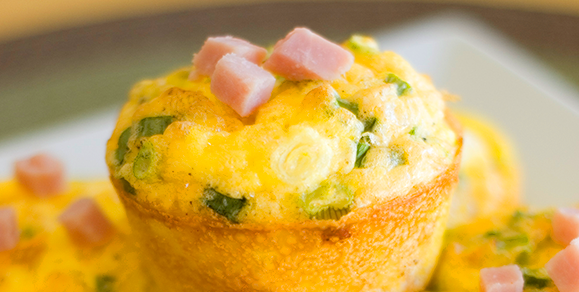 Here’s a yummy savoury recipe great at anytime of the day. Sea salt and pepper to season. Bacon or Ham for toppings. Grease a 6-hole muffin tin with oil. 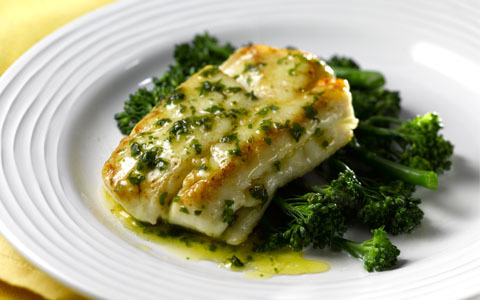 Chop the broccoli into medium sized florets and place them into a steamer or colander sitting over a pan of boiling water. Cover with a lid and let stem for 5 minutes. Place the steamed broccoli into a bowl with the eggs and salt & pepper (if you’re using them to season) and then whisk together. Pour the mixture into the muffin tin and divide the cheese evenly among them. Why not add some bacon for extra flavour, just them cut up and serve alongside or on top. Perfect for anytime of the day! Serves Makes two small terrines, each serving four. Preheat a very cool oven, Gas Mark ½, 125°C (250°F). Butter and flour a large baking sheet. Whisk the egg whites until stiff, add the caster sugar slowly, whisking until completely dissolved, then lightly fold in the icing sugar. Pipe the mixture into small circular shapes and bake in the low oven for about 1½ hours to dry out without colouring. Cool and store in an airtight container. Heat the milk with the granulated sugar and split vanilla pod (scrape seeds into the milk). When just boiling, remove from the heat, cover and leave 10 minutes to infuse. Meanwhile beat the egg yolks with the caster sugar until the sugar has completely dissolved and the mixture is creamy. Bring the milk infusion back to the boil, add to the yolk mixture, keep whisking and return to the rinsed saucepan. Cook over medium heat, whisking all the time, to thicken a little – be very careful not to overcook – then strain through a very fine sieve. Whisk softened gelatine into the mixture and allow to cool, whisking occasionally. When cold, churn the mixture in an ice cream maker until thick. Sort through the blackberries, removing any stems; wash and drain. Put sugar and water into a pan and heat to dissolve, then bring up to the boil. Allow to cool, then add the blackberries. Line two small loaf tins, 18cm x 6.5cm (7″ x 2½”) with overlapping clingfilm. Break up the meringues and fill the bottom of each tin, add ice cream, then some of the marinated blackberries. Cover with another layer of ice cream, close with overlapping clingfilm and freeze. Liquidise the marinated blackberries and strain to make a sauce. Pour a little onto large dinner plates, slice the ice cream terrine and lay on top of the blackberry sauce.